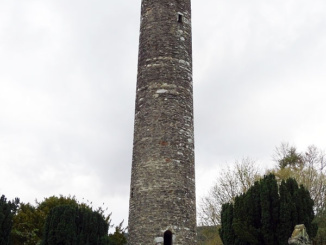 Today we boarded our coach to Glendalough the Valley of the Two Lakes at 8:30am. 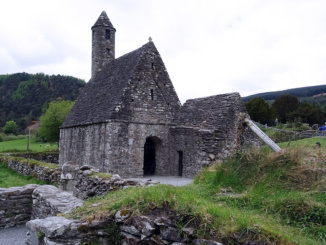 The trip from the port of Dublin to Glendalough was about 90 minutes. 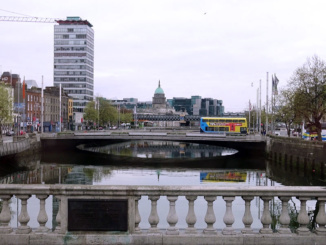 Upon entering the bus our first view out the window was of the Samuel Beckett Bridge whose steel beam span was constructed in Rotterdam and brought here as a gift to the city. 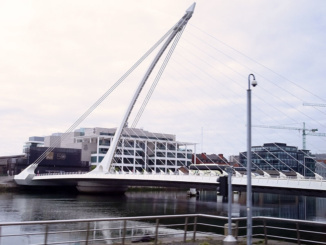 The cabling of the Samuel Beckett Bridge resembles that of a harp and thus the national symbol for Ireland. 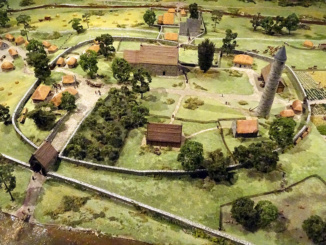 The Vikings settled in this region in about 851 after many years of successfully raiding the area. Douglas Ross Hyde was elected as the first president of Ireland in 1938 when this young country was just forming. The Republic of Ireland came into existence on April 18, 1949. 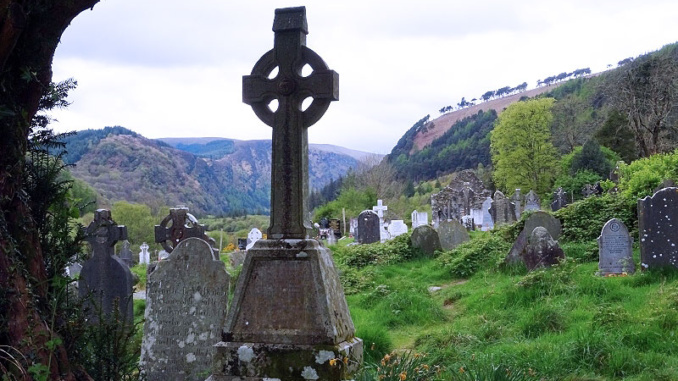 County Wicklow is considered a glacial valley and the most forested county in Ireland. Wood from this region was used to build the second largest Viking long ship ever recorded. 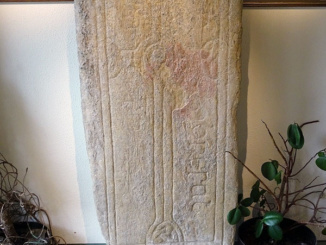 St. Kevin led a small group of monks here to start a monastery at the convergence of the two rivers. He was said to have been such a gentle man that a bird might lay an egg in his hand. 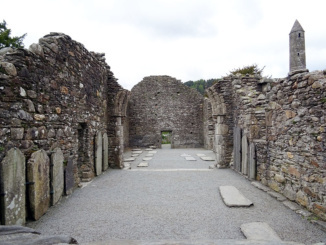 When we arrived at Glendalough, we entered the Visitor’s center and viewed a short video giving us the background of the area. We then walked around a small museum that contained a miniature replica of the once serene monastery and presented other historical artifacts. Our tour guide then gave us one and a half hours of free time to wonder about the area. 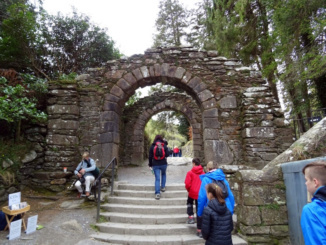 The 1400 year old monastic site, known as Glendalough, features a stone entry Gateway that is unique to this site only. 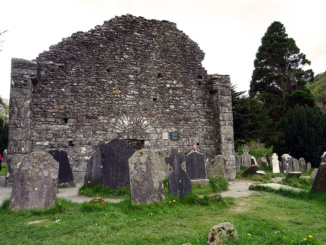 It also features a Round Tower, Cathedral, The Priests House and the remains of three churches (Kevin’s Church, St. Kieran’s Church and St Mary’s Church) as well as an ancient/new graveyard. There were many structures throughout the compound but most were reduced to just stone walls. Being as the roofs would have been made of wood, those had long decayed. 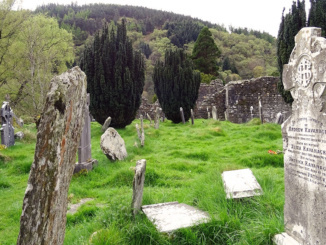 Throughout our walk, we were fascinated by the number of old gravesites and the fact that local residents were still being buried there. It was surreal to walk around in this protected glacial area that was once considered a religious sanctuary. After taking many photos, we met up with our tour group for our return to the ship at 12:30pm. 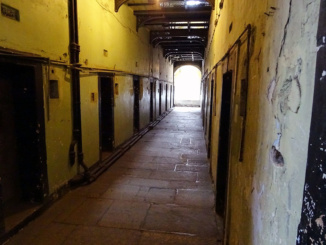 Since we had tickets to the Kilmainham Gaol (a jail) in Dublin, we asked our guide if we could be dropped off in downtown Dublin on our return. To our surprise our request was granted and we, along with others from the tour departed the bus at the sculpture of Oscar Wilde in Merrion Square Park at 1:45pm. 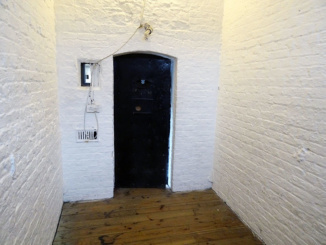 From there we caught a taxi to Kilmainham Gaol for 13 Euro. Because this attraction often sells out, we pre-purchased our tickets two months earlier at the coast of 8 Euro each. 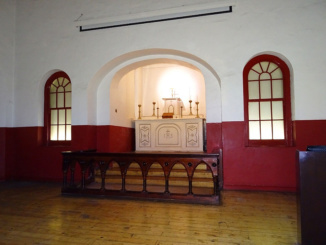 We arrived at the Kilmainham Gaol about one hour before our scheduled time and were asked to return in our timeslot. With time to kill we headed across the street to the Patriot’s Inn Pub where we had the sandwich of the day Ham & Turkey. Two sandwiches and two pints of Guinness was 30 Euro with the Guinness being one of our many highlights of our vacation. 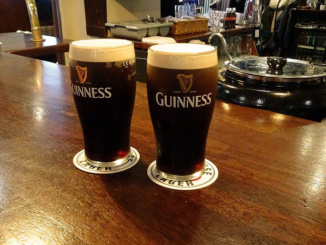 The Guinness was smooth and very fresh and was truly enjoyable. During our lunch, four other Americans showed up who were vacationing in the area from New York. We had great conversation and a terrific meal. 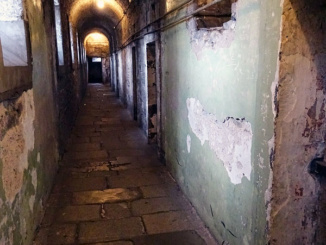 Soon we were back at the entrance to Kilmainham Gaol and were sent to the holding cells to await the start of our timed tour. Our tour began at 3:30pm with a group of twenty-five patrons. 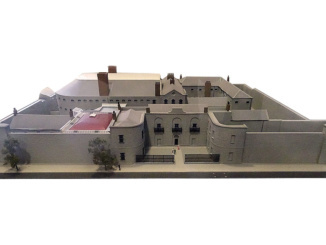 Our tour started at the 1916 Corridor in the West Wing and proceeded to the East Wing that was opened in 1862. 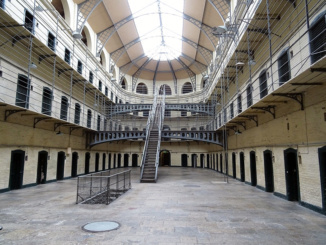 The Kilmainham Gaol, which first opened its doors in 1796, was known as a harsh prison and played a large part in the Independence of the Irish people. 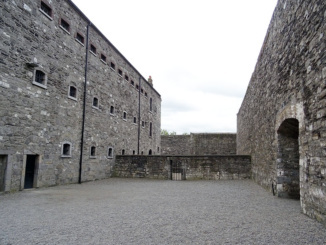 Many political prisoners were held or executed here throughout its existence with the stone breakers yard executions of 1916 being the most famous. The prison has also been featured over the years in several movies including The Italian Job. 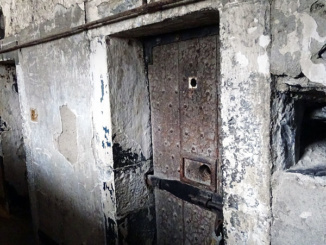 The Kilmainham Gaol was decommissioned in 1924. 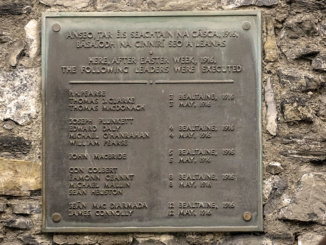 At the end of the tour was a wonderful multi-level museum highlighting the Kilmainham Gaol, its prisoners, and the plight of the many people striving for Irish Nationalism. Allow about 1 hour for the tour and 1 hour for the museum afterwards.